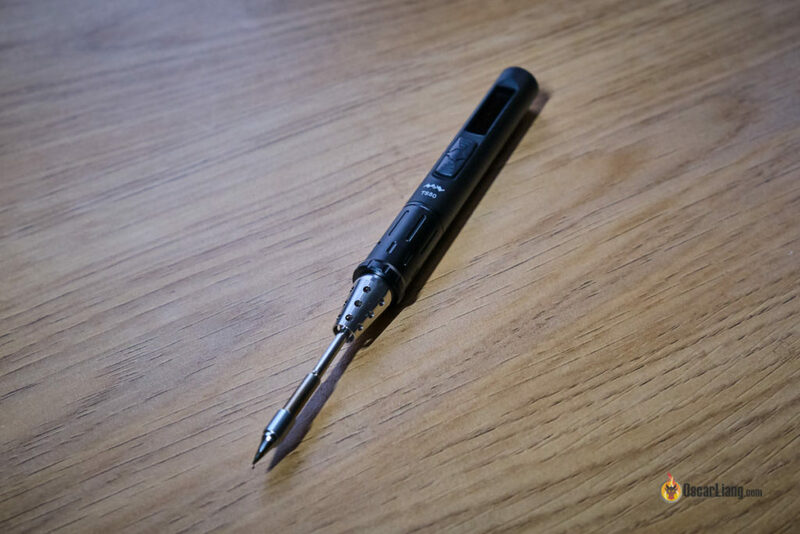 The company that makes one of the best portable soldering irons, the TS100, has recently released a new model, the TS-80! In this review we will take a look at the new features of the TS80, and whether it’s better than the TS100. 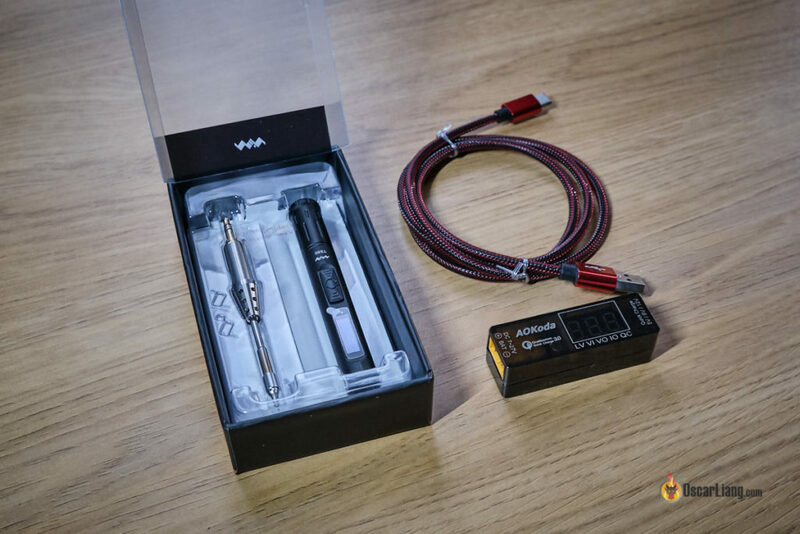 Here is my TS100 soldering iron review. Many people love the TS100 because of the small form factor and portability. What if I tell you that the TS80 is even smaller! The TS-80 shell is made of anodized aluminium and feels to have better build quality over the TS100, which is just plastic. For this reason, the TS80 is actually heavier, at 35g, while the TS100 weighs only 31g, despite being bigger. The TS80 is easier to hold than the TS100 thanks to more ergonomic grip. Note that the TS80 also has a shorter grip-to-tip distance, which helps with soldering precision. The grip on the T80 is actually removable so I supposed there would be an upgraded grip in the future? One of the biggest differences between the TS80 and TS100 is perhaps the input power. The TS100 can be powered by a DC input voltage between 12V-24V, via a 5.5mm barrel connector. That’s probably the reason why the FPV and RC community love it so much, as you can simply use a 4S to 6S LiPo to power it. Very handy for field repairing too. 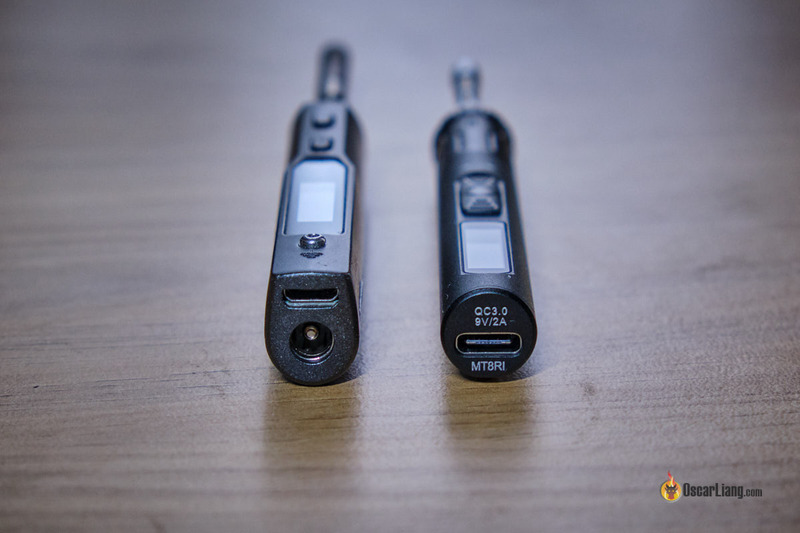 On the other hand, the TS80 uses a USB-C interface, and requires USB port with QC3.0 standard (quick charge). Basically, QC3.0 means a USB port is capable of supplying up to 2A at 9V for high power applications, like quick charging. For this reason, it probably won’t work when you connect it to your computer. It will need some special power supply which i will talk about later in this post. TS80 and TS100, Which is the “Hotter Iron”? I did some testing, and actual soldering with both irons back to back, and see if I notice any difference. I was powering the TS100 with 24V, and set both irons to 400°C to ensure the test is fair. When building a quadcopter, the hardest part in soldering is probably the ground plane of a PDB! Because it’s basically just a massive piece of copper that requires a lot of heat. The TS80 is only a 18W iron, so I was expecting (much) better result from the TS100, given the higher power rating of 65W. Surprisingly, the difference isn’t really that obvious just based on my observations! Yes, it takes a second or two longer for the TS80 to melt the solder on the PDB, but it’s subtle. To get a fuller picture of the performance, I used a power meter to get some more data. I basically kept the tip of the iron on the ground plane of a PDB (basically a large piece of copper) with a good amount of solder for good contact for 5-6 seconds, and measured the power and temperature. Interestingly, the TS100 only puts out 20W to 22W during the test, and the temperature drop was only 10°C to 390°C. The power peaked at 60W when I first power it up but quickly drops to around 20W again. Maybe it only uses higher power with high temperature drop. This suggest the TS100 can put out more heat and more consistently than the TS80, and it also has a lot more headroom if more heat is required. Yes, the TS80 is very nice, but there are areas the TS100 are doing better apart from heat performance. First off, the TS100 is over $30 cheaper than the TS80 last I checked. Secondly, the maximum temperature you can set the TS80 to is 400°C, which is lower than the TS100’s 450°C with custom firmware. Also I find the TS100 easier to adjust temperature by simply pressing the up and down buttons. With the TS80, you first have to go to the settings menu, then find the temperature option for adjustment… Not a deal breaker, but annoyance all the same. Both TS100 and TS80 are high quality portable soldering irons, probably the best in the market right now. The decision really comes down to what features you are after. The TS80 has excellent ergonomics, and the overall build quality is just so much nicer! It’s a tough call, but I still find the TS100 a more versatile option for building RC models. It has higher power yet it’s a lot more affordable, and you can power it directly from LiPo batteries without any adapter. But with an LiPo to USB adapter, the TS80 can be equally convenient. But which is better, the AOKoda or iSDT BG8S? From my testing (yes I have tested both), I found the BG-8S provides slightly more consistent maximum power and stays cooler (makes sense given the much higher price). The AOKoda was giving out only 17W while the BG-8S was doing 18W consistently. The difference is not huge, but it’s there. I guess the wall wrath from the S8 or S9 will do nicely since these are fast charge adapters, and handsome small.